250ok is a provider of advanced email analytics and deliverability products, offering a customized platform boasting global seed coverage with over 100 mailbox providers. Employed by some of the leading Email Service Providers (ESPs) and enterprise-level marketers, the suite of 250ok products drive insights around inbox performance, sender reputation, DMARC compliance / fraud protection, design rendering on multiple devices and also customer engagement. Starting with 250ok Inbox, users can test, monitor and resolve inbox placement issues in real time by leveraging coverage of international B2B and B2C mailbox providers. Optimized seed testing, via 250ok's patent pending Seedlist Optimizer, is streamlined to focus only on email list composition and the providers being mailed while automated notifications promise to highlight the issues of most importance. The rule-based 250ok Alerts can send email, SMS, webhook notifications alongside in-app support for third-party apps including Slack, HipChat and PagerDuty. 250ok Reputation then monitors email reputation with a proprietary global spam trap network, feedback loop and real-time blacklist monitoring to mitigate complaint levels while ensuring the right messages can go to the right recipients. 250ok DMARC then aims to protect a brand and its customers with DMARC report analysis to summarize compliance trends and corrective actions within its Message Center feature. With data visualization tools for gauging holistic email performance, 250ok Analytics and the platform's drag and drop deliverability dashboards, offer real-time tracking, advanced filtering and segmentation, plus widget-based reporting sharable across marketing teams. Lastly, 250ok Design promises an email previewing module that recognizes over 70 email clients and devices, utilizing leading rendering providers to capture screenshots from imported ESP templates or campaign HTML upload. 250OK does almost everything we are looking for and has a great support team, dedicated to not only providing answers but understanding, in our quest to learn more about email deliverability.Love the interface and UI. Streamlined and easily accessible. Customizable dashboards right up front. You can view the kind of granular data like what inbox are they using, what long/latitude, time of day, mobile vs desktop etc. Love the interface and UI. Streamlined and easily accessible. Customizable dashboards right up front. You can view the kind of granular data like what inbox are they using, what long/latitude, time of day, mobile vs desktop etc. Those Dashboards cannot be drilled into, or even copy and pasted (IP ranges listed from spamtraps for example). Sometimes to level of detail is not granular enough. We are noticing that the way 250OK records spamtraps/blacklistings, is via seed lists of their tracked inboxes. Not quite what we need but helps provide a cookie crumb trail of where to look. Seamless interface and integrations, pleasure to use by both devs and luddites. The employees / customer support. They're very responsive to feedback and seem to work hard to improve their products. The wide variety of features blends well in the interface, and "child accounts" let you securely distribute services to clients. It's definitely not cheap. It's good they sell products separately to build your own suite of features, so you're not paying for unused services. We are notified when senders are hitting spam traps and provided with the subject line of that email. We are able to then work with the sender directly to correct the problem.I like that 250ok gives us a way to monitor when spam traps are hit so that we can then deal with each customer directly to resolve the issue. I like that 250ok gives us a way to monitor when spam traps are hit so that we can then deal with each customer directly to resolve the issue. It's not comprehensive - there are other systems that monitor traps not covered by 250ok. I wish that their "coverage" in this respect was more wide-reaching so we could deal with them exclusively! A great tool for our support team to manage all blacklists and spamtraps. We wish the API was a little easier to use. Deliverability is critical in a loud and crowded market. There are many points of vulnerability and 250ok will help you track, monitor, and fix whatever comes your way. Really enjoyed the service and deep dives with their consulting services. They give a wide range of options on how you want to engage. We dove in with a deep dive around our current status, then were able to engage on the platform to track key metrics. I love that I can re-engage in a project by project basis as needed in the future. Really enjoyed the service and deep dives with their consulting services. They give a wide range of options on how you want to engage. We dove in with a deep dive around our current status, then were able to engage on the platform to track key metrics. I love that I can re-engage in a project by project basis as needed in the future. You really have to have a deep understanding of the inter-workings of email to understand what this group does - which makes it hard to sell up the corporate ladder. Request a demo and receive full pricing quote via the website. 250ok is a cloud-based email analytics and deliverability monitoring suite with 250ok Inbox measuring inbox placement and 250ok Reputation gauging email marketing reputation. 250ok DMARC collects and analyzes DMARC reports to flag up compliance issues and suggest corrective action, while 250ok Analytics provides real-time engagement tracking, holistic performance data, with report filtering and segmentation tools. Preview campaigns in over 70 email clients and devices with 250ok Design, importing ESP templates or HTML to then render screenshot previews using leading providers Litmus and Email on Acid. The product's patent pending Seedlist Optimizer feature allows users to focus only on the mailbox providers being sent to, uploading and analyzing the composition of a mailing list to identify ISPs worth targeting. Deliverability Dashboards offer customizable, widget-based reporting capabilities that can eb shared between teams, while 250ok Alerts provide rule-based deliverability monitoring notifications via email, SMS, webhook message or third-party apps. Below are some frequently asked questions for 250ok. Q. What type of pricing plans does 250ok offer? Q. Who are the typical users of 250ok? Q. What languages does 250ok support? Q. Does 250ok support mobile devices? Q. Does 250ok offer an API? Yes, 250ok has an API available for use. Q. What other apps does 250ok integrate with? Q. 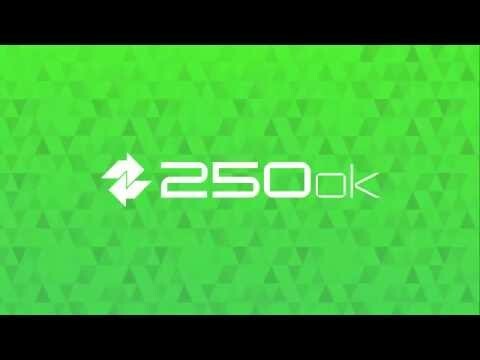 What level of support does 250ok offer?